Arrowhead at Vail is the Vail Valley's 'private address.' Arrowhead Village is a private, gated residential resort community offering 'members only' amenities. Our two bedroom condominium is part of an elegant enclave of exclusive condominiums at the base of Arrowhead Mountain. Enjoy North America's only village to village ski experience which connects Arrowhead mountain to Beaver Creek resorts through Bachelor Gulch. 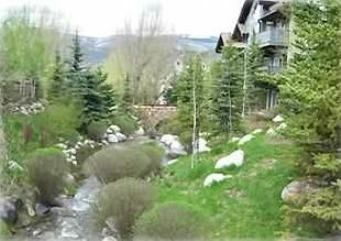 You can ski from Arrowhead to Bachelor Gulch to Beaver Creek and return by day's end to for a refreshing swim in the heated outdoor lap pool, relax in one of the Jacuzzis, and then have a glass of Merlot in front of your fireplace. The pool is open all year and there is pool side restaurant service in the summer. Our tastefully appointed, second-floor condominium is bright, spacious, and cozy. The master has a King bed, TV, and jetted tub in the bathroom. The second bedroom has a bunk bed (double on the bottom and twin on top) and a twin bed (sleeps four total). There is a washer and dryer in the unit. Our unit is in excellent condition (built in 1998) and the furniture is brand new (winter 2005). Our huge picture windows overlooks the creek. Enjoy a BBQ on the deck. Step out the back door and your steps to the ski lift and pool. Step out the front door and walk to your first hole at the Country Club of the Rockies Golf Course. If there is still snow on the course, grab your cross country skis or snowshoes. If you would like, you can arrange for a horse drawn sleigh ride instead. In the summer, the kids can swim, play at the park and then have a barbecue - all located in the village, walking distance from the condominium. Free Wireless Is Available Inside The Condo. Once you arrive to our condominium, you can leave your car in our secured, heated, underground parking lot and never drive again until you leave. You are within walking distance of two restaurants - the Country Club of the Rockies or the Bristol at the base of the mountain. There is a free shuttle to and from Beaver Creek Village. If you prefer to explore, two miles west is the town of Edwards which has many dining options to choose from as well as a lively nightlife. Edwards has become the new 'hip' place to hang out for locals and tourists. Check out their interesting boutiques or catch a movie. Arrowhead is a delightful get-away from the hustle and bustle of Vail. Arrowhead is easily accessed from Vail (15 minutes) or the Eagle Airport (40 minutes). Our family just spent 5 days in a winter wonderland! We went to Colorado for the skiing and you will have plenty of access to that from this location. It's less than 100 yards from the building where this condo is located to the Arrowhead ski lift. The ski locker is spacious and had enough room for 2 adult skis and 3 kids skis. Quick 15 minute shuttle ride to Beaver Creek Ski Resort. The accommodations were really nice with the two bedrooms and two baths providing lots of room for our family of 5. The view from the window was breathtaking. The electric fire was super easy to turn on and provided some nice heat at the end of the day. Phyllis was easy to contact and very helpful. We will definitely be back again!